Are you looking for fun and easy crafts to do with the kids this year? Nothing makes me happier then a Christmas tree filled with little handmade ornaments, and what child or adult doesn’t enjoy a little finger painting! This craft also makes for a wonderful classroom activity and a nice gift for children to bring home to mom and dad. Plus, did I mention easy? It’s also affordable! This craft only requires 5 supplies, the simpler the better. Thumbprint crafts have long been a favorite and we have done this on everything from tiny clear balls, to jars, round ornaments and in this tutorial, I’m showing you how to do them on these really fun clear Clear Plastic Bulb Shaped Ornaments that you can buy in bulk but can also find at almost any craft store. Remove the metal top from your ornament. Fill the ornament about ¼ of the way with acrylic paint, in the color of your choice. Slowly spin the ornament to coat the entire inside with paint, add more if needed. Place mental top back on the ornament. Paint your or your child’s thumb with brown acrylic paint. Less is more! Stamp the ornament carefully with your or your child’s thumb. Quick motions are best for a clean thumbprint. Once dry (I used a blow dryer to speed up the process) dip your Q-tip in red paint to add a red nose to your reindeer! 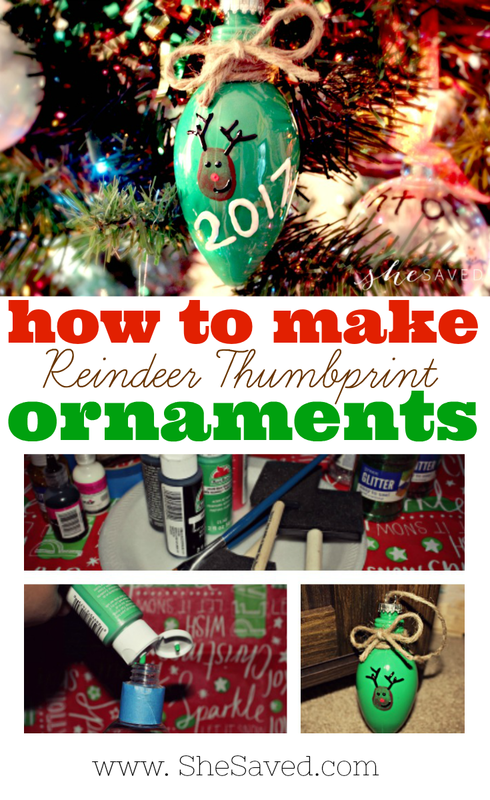 Use your black puffy paint to add antlers, eyes and a mouth to your reindeer. 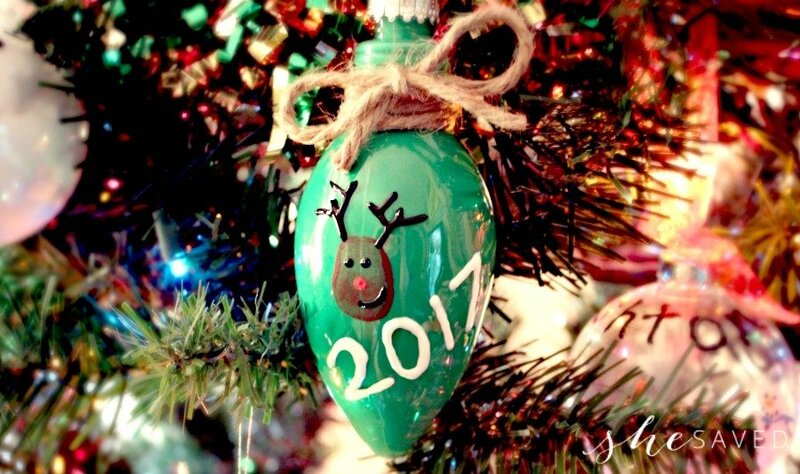 Use a puffy paint color of your choice to put a year on your ornament. Use your twine to hang the ornament from the tree and/or create a cute bow for the top of your ornament. Hang from the tree for all to see!